Corset question again! With pics though..
Getting smells out of suede boots?? Hey all! Here I am again haha, having corset problems. Anywaaays- I'm going to a party where my friend's friend plays in his metal band, and I recently threw out all clothes I could wear to those parties, except for my corset. Now I totally have a questions, what should I wear under this corset? it seems like it´s a full corset, isn´t it? so you could probably wear it solo. but i can understand if you don´t want to do it, if you´re not really used to it, it feels a bit naked and i, for one have always doubts about the deep collar even i know people can´t see anything and anything will "fall" out (especially on me ). I agree with so lala a shrug with short sleeves/half sleeves it's a good idea. I would probably wear it over a round neckline, long sleeved t-shirt for winter. I wear my corsets and halters with long sleeve shirts when it's cold, I have also worn shrugs and boleros to cover my shoulders. Depending on how thick the under layer it, all options work out fine. 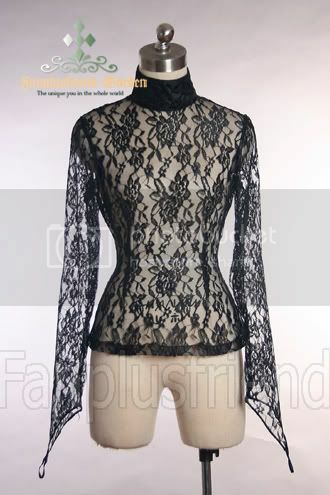 If you layered it over a lace shirt you would feel more modest without taking away from the corset.